Surprisingly this is my very first pecan pie. I searched far and wide for the very best recipe but there were so many variations to choose from. 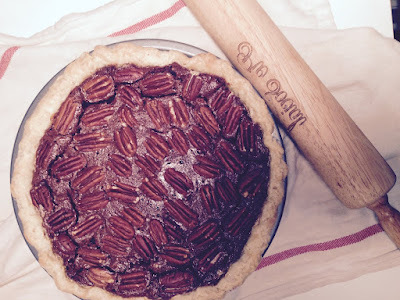 I finally settled on Melissa Clark's recipe for Chocolate Pecan Pie, which was featured at cooking.nytimes.com. I liked the idea of adding a bit of depth to an otherwise very sweet pie with bittersweet chocolate and bourbon. The proof is in the first bite. Delicious.